This morning it was cloudy and cool. When Bode took me out for a walk, we saw a bunch of teens running on the bike path followed by a man on a bicycle. When we went out to visit the farmer’s market and grocery store, a group of cheerleaders were working out on the high school lawn. School starts in just a few weeks. We ran errands on Monday, had a pleasant surprise when we stopped at the vet. Bode was down to 45 pounds. He was looking trim, guess twice a day walkies really works. Yesterday I did yard work and transplanted strawberry and columbine seedlings, then rested in the afternoon. 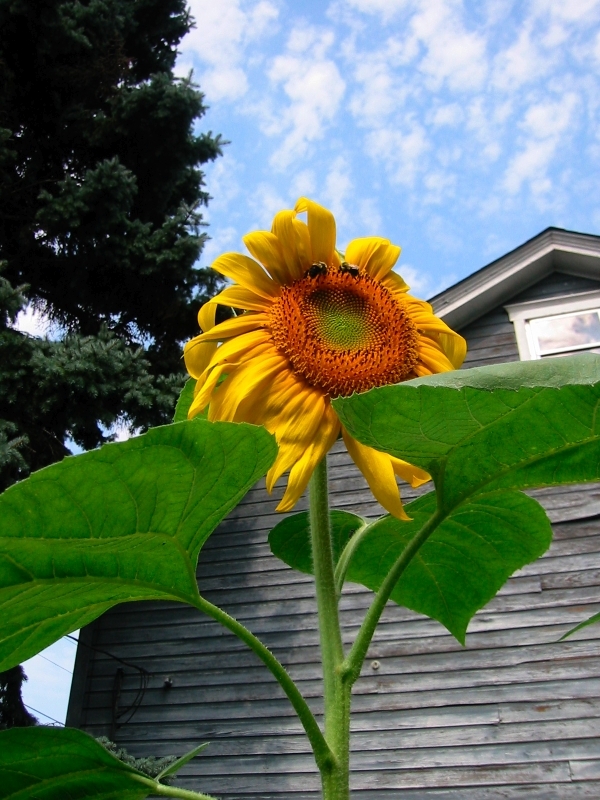 The two tallest sunflowers opened. 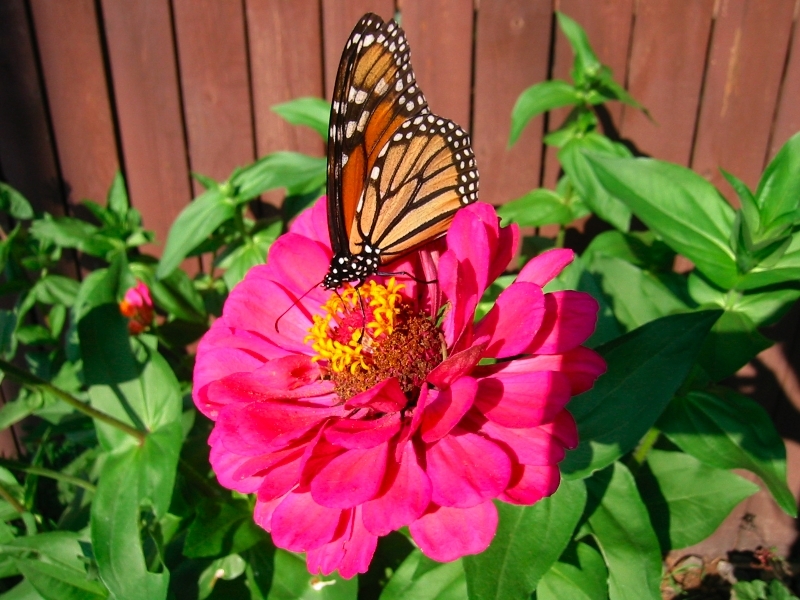 Later in the afternoon while I was sitting on the deck I saw a Monarch butterfly visiting the zinnias by the walk. She came back several times and didn’t seem to mind posing at all. When I visited my folks on Monday, mother said she could use some garlic. I mentioned that I got some red garlic at the Farmer’s Market for 75 cents per bulb that was very nice. Turned out she didn’t need it right away and with the pool closed for routine maintenance at the YMCA this week, was free this morning to shop. They had white hard and soft neck garlic and I got a cantaloupe too. Summer Rambo and Ginger Gold (love the names!) were the two apple varieties in season, but I still had some from the last time, so I chose white peaches and prune plums. Yesterday evening Bode and I stopped to talk to three women who were walking along the river. The conversation turned to peaches, so I was more than ready for them. I ate two peaches when we got home, they were melt-in-your-mouth ripe!